How many of you are fed up with the state of the United States? How many of you simply cannot believe that our once-proud nation has been taken over by sluggards, sloths, free-loaders and leeches, many of whom are illegally present within the country, and who are taking benefits hand-over-fist originally designed to assist citizens – which they are NOT? How many of you are fed up that the elected officials are assisting in this non-USA take-over as hard and as fast as humanly possible? You can vote – except that states Obama won don’t have a voter ID law, which facilitated the massive voter fraud that got his sorry a** elected not once, but twice. The other way you can vote is with your feet. You can leave, and stop assisting in the suicide of the USA with your tax dollars. I did it. I sold my belongings, and moved country. No, I am not a multi-gazillionaire, looking to hide my assets from the rapacious USA tax code – but for those who are, more power to you. Hurting the USA financially appears to be the only way politicians ever listen. I moved out of the USA. No, I have not (yet) repudiated my citizenship…but if they keep going the way they are going, that will be coming soon, too. How do you just leave the country? Easy. Work overseas. Especially if you are a teacher, you don’t have to put up with draconian USA Department of Education crap. Nor do you have to unwillingly donate half or more of your income to the greedy USA IRS, either. Teachers can quite easily make the transition to ex-patriot life. Not sure about other career options, but they do exist overseas, as well. Teachers earn USA tax-free income, and sometimes also pay no taxes in the country where they are living and teaching. Plus, international schools OFTEN provide free housing and medical insurance, plus many offer free flights there and back. And the students are students, like anywhere else. Some good, some bad, so what? So, my money is no longer feeding that insatiable USA government-out-of-control. Vote with your feet. LEAVE. Face it, we are all that we are. The good, the bad, the beautiful and the ugly – that’s us. Sometimes it’s all four at the same time, but at least it is real when it is a genuine reflection of who we are as human beings. Everybody has something to give, even if it is only serving as a bad example for others to avoid. Hey, we need those, too…actually, we don’t NEED them, we just HAVE them. Some days I am a positive example. I manage to do things mostly right, with compassion and sensitivity. And some other days, I’m doing good not to kill anybody. Well. We all have them. I would of course prefer to think that I make a positive contribution to humanity each and every day. I am equally certain that most of us would prefer to think of ourselves in this way – a positive, helpful, constructive way. Yeah, right. Some days it is all I can manage to get out of the bed…and there have been a few where I could not manage even that, much less anything else actually positive. At least, the days I spent in bed were not examples of negative consequences…usually I was just too sick to be bothered with the rest of humanity. Illness aside, for the time I spend in bed, anyway, I am not usually causing damage! It is when I get up and get moving that the trouble starts. WHY does it seem that some people are doing all in their power to get all over my last, my very last, nerve? When that happens, I try to perform that “soft answer turneth away wrath” thing, and I say something similar to “I am really sorry you are obviously having a bad day. I hope that your day gets much better from here on.” It can’t hurt. AND it reminds me that I have days like that sometimes, too, so the least I can do is be considerate of somebody else who is smack dab in the middle of one. Even if they have just pissed me off six ways from Sunday. Even if. Published February 25, 2014, in the Herald Leader, Fitzgerald, Georgia (USA) weekly newspaper. Lately, most Islamic countries have been pretty much OFF the list as desirable places to live, work and retire. Political unrest is not attractive for those in the market for a place to live. This black eye, however, is undeserved in several cases, and Morocco is close to the top of the list as a pleasant place to consider living. Morocco is located in the upper north-western corner of the African continent. Morocco and the United States share a companionable history – did you know that Morocco was the first country to officially recognize the fledgling USA as a nation? Morocco is an Islamic country in that Islam is the official state religion, and the majority of its citizens are Muslim, but there are people of other faiths here as well, and tolerance is the theme, espoused and endorsed by Morocco’s progressive king, Mohammad VI, as well. A lot of Morocco is hot, often too hot to be comfortable without expensive air conditioning. After all, the Sahara Desert begins in eastern Morocco, and hot was invented there! However, Morocco has mountain ranges that run lengthwise down the middle of the country like a backbone: the Middle and High Atlas Mountains. In the Middle Atlas, you will find the lovely little city of Azrou. 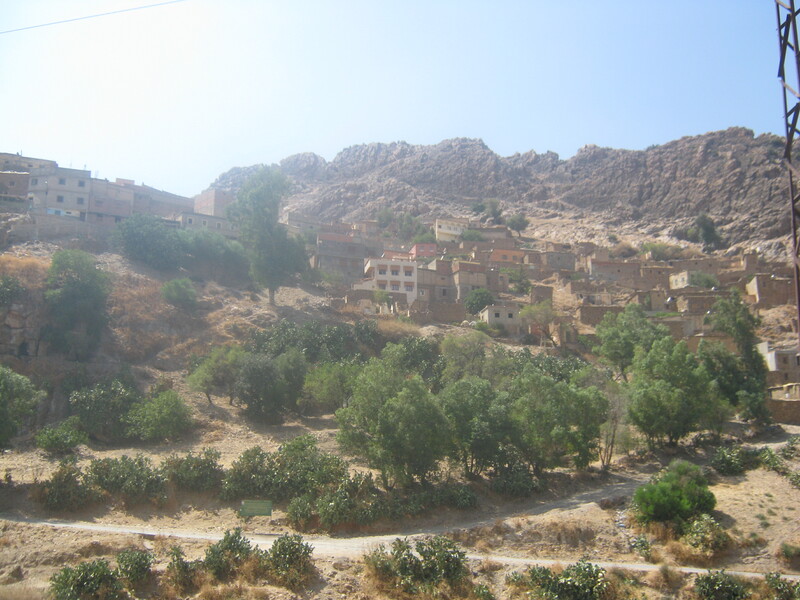 Azrou is a little less than a mile high in elevation, and has a comfortable climate that is much cooler than other locations in Morocco, even seeing some snow during the winter months. There is a ski resort in the neighboring town of Ifrane (10 miles away), which incidentally, is home to Morocco’s only English-speaking University (Al Akhawayn University). For those who enjoy winter sports, there are African slopes waiting! And, unlike some other places, Morocco enjoys excellent water. Several brands of bottled mineral water originate near Azrou, and water here is delicious straight from the tap. Being in the mountains does no damage to the views, either! There are lovely, rolling hills all around Azrou, and the drive to either of the larger cities nearby, imperial Meknes (UNESCO World Heritage site) or imperial Fez (UNESCO World Heritage site) includes some breathtaking scenic spots begging for your camera. Meknes is surrounded by vineyards, and local wine produced there and elsewhere in Morocco is both tasty and relatively inexpensive. There is a good selection at prices less than 10 USD a bottle. The extensive Roman ruins of Volubilis (yet another UNESCO World Heritage site) are a little over an hour’s drive away from Azrou. 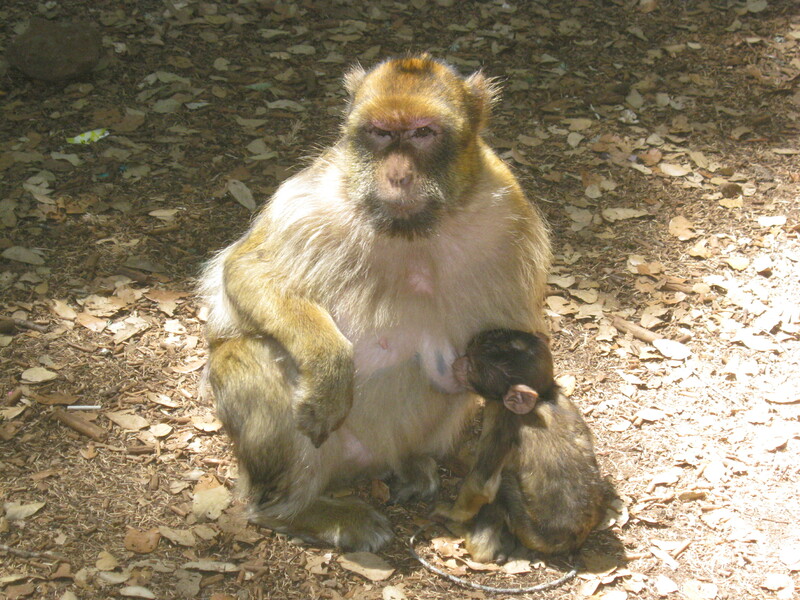 Azrou adjoins one of Morocco’s National parks, and there are Barbary Macaques (monkey), that make their home there who are accustomed to being fed by park visitors, though for your safety consider photos only. Hiking, biking and camping opportunities abound nearby in nearly any direction, including being able to explore some nearby extinct volcano calderas and some lovely waterfalls. Outdoorsy people will find plenty to do. My husband and I moved to Morocco knowing not a word of Arabic or French, the two most common languages spoken in Morocco, and we have done just fine here for three years. The Moroccans are lovely people, helpful and generous, and many speak enough English to be able to transact business, even for us Americans, and are appreciative when you do your best to learn and speak Arabic. Azrou is primarily a farming community, with a few tourist shops featuring handicrafts thrown in for good measure. The weekly souk (farmer and flea market) here is on Tuesdays, with inexpensive, fresh produce, all manner of household goods, clothing and livestock sold weekly, but anything you might want is also available from small shops all over town any day of the week. There is also a fish farm in town that sells smoked or fresh fish, dressed fresh to your order. Restaurants in town range from inexpensive sandwich shops (where you can eat for less than two dollars USD), to dining experiences featuring the finest in French cuisine, without the expensive European price tag. Medical care and dental care both are good and inexpensive. My husband’s recent oral surgery cost us 125 USD, and his bridge will be made by a Boston University-trained dentist, for thousands less than what the identical services would have cost us back home. Our two-bedroom, two-bath rooftop apartment, with a balcony and a private roof terrace, sets us back 1,500 Moroccan dirham a month, which is 176.50 USD. Water, gas, electricity, phones and Internet run about 500 dirhams more a month: 63 USD more. We can do just fine here on much less than a thousand USD per month – our living expenses alone run about 650 USD, without including the costs of our small car, which accounts for the rest of the thousand per month. We bought the used car for our occasional trips around Morocco and to Spain, which has two toeholds, nice little cities, five hour’s drive away from Azrou along Morocco’s northern coastline. Morocco has excellent, inexpensive bus service and the trains are quite nice, too, as well as inexpensive, for those who’d rather not maintain an automobile. For those considering locations around the world for potential retirement, Morocco has a low cost of living, a good standard of living even on a limited budget, and a very nice proximity to vacationing in Europe, while not paying Europe’s often higher costs of living. A small, but efficient, regional airport in nearby Fez serves cities in Spain, Italy, London, Paris and more, on one of several low-cost carriers. Seasonal fares can be so low we can actually afford to fly to Rome for just the weekend, occasionally. Try THAT in the US! We had high hopes for Morocco when we made the decision to move, and it has certainly fulfilled them. If you are looking at international locations, consider exotic Morocco! Moroccan Arabic Phrasebook (2nd ed. ), Bacon, Andjar and Benchehda, 1999. Lonely Planet Publications, ISBN: 0864425864. Moroccan consulate in New York: http://www.moroccanconsulate.com/, requirements for Moroccan visas and other information for travelers to Morocco. US Embassy in Casablanca, Morocco: morocco.usembassy.gov/news.html, has hours of operation, directions, visa, passport information and more resources. Above: Site has MANY useful links all about Morocco, in English – including links for learning Moroccan Arabic. Above: Free Arabic lessons online. For beginners – starts with the alphabet! Above: Free online French lessons for beginners. Written after my move to Fitzgerald, Ga in 2006 – published in the local city paper. I am definitely a newcomer to this small southern town. Never mind that more than five generations of my family have lived here – I am the newcomer. I know this for a fact because of one simple, minor, annoying small thing. There is, on Lemon Street, a stop sign in front of a railroad track crossing. Now this is a spur track that serves the industrial part of town, and there are seldom trains that use this track. It is quite clear that this fact is well known to all who live in this small town – all except for ME (the newcomer). I still see a stop sign at this railroad crossing. I am apparently the only one in town who does – no one, and I mean NO ONE else in town, stops for this sign. Not even the city propane truck stops at this sign, even though it clearly states on the truck’s bumper “We stop at all railroad crossings.” Doesn’t matter – they don’t stop. Neither, by the way, do the police – either the city police or the sheriff’s deputies! I am apparently the only fool in town who has not figured out that this one particular stop sign is entirely optional, and may freely be ignored, at will, with complete impunity. I have nearly been rear-ended three times trying to stop for this sign when I was followed by another city resident who could not tell I was a newcomer (and did not know the secret) and who was quite obviously NOT expecting for this crazy fool to stop for the sign that nobody else stops for. I wonder – will I no longer be new if I stop stopping? I am a murderer, responsible for the death (an agonizing one, not clean and quick) of a creature I loved very, very much. The prickle of tears is starting again as I confess this unpardonable sin, and it is only right that I should flagellate myself this way….my babies depend on me to care for them, and I let Fluff-man down in the most awful way. I had to leave Panama to renew my tourist visa, because document thieves stole my FBI Criminal Background Check document in Miami, and this document is required to begin the months-long process of getting my work visa. Without it I cannot apply, and replacing it has been a nightmare of delays and waiting. So, I booked Costa Rica to renew my visa over our school’s Christmas break. Because I have been robbed here in Panama twice already (once in my home and once in the street) I was not willing to give a key to my house to the next door neighbor who agreed to care for the cats while I was gone. Instead, I fixed a place in the screened metal security door where the cats could come and go, and I placed a large metal crate over this opening, so they could exit the house (into the crate) to access their potty, and the neighbor could tend it without actually entering the house. Belongings safe, right? No dogs have access to the cats, either, right? Then, I took all six kitchen table chairs and placed one heavy chair in front of each and every door inside my house, so that the wind (which occasionally is pretty strong) could not possibly blow any inside door shut, which might trap a cat. Then, I filled each and every pan and bowl I owned with kibble or water, and placed them all around: kitchen, living room, both bathrooms. I even put one bowl in the bathroom sink and left the tap dripping into it, and filled both sides of the kitchen sink for good measure. Secure in the knowledge that there was super-abundant water and food available, and access for the kitty potty, I headed off on my visit to Costa Rica to renew my six-month tourist visa. Well. The best laid plans of mice, men and kitty mommies aft gang agly. The chair I placed in front of one bedroom door did blow shut. The wind just pushed the heavy chair aside, and when the door shut, Fluff-man was inside. The food and water bowls, so many of them, were all in other rooms. The neighbor heard Fluff meowing after some days, and they took out the window glass to get him out of the room. However, because he’d had no water, he was dehydrated…and when you are seriously dehydrated, you lose the desire to drink. They did not know to force-feed him water, and they did not know to take him to the veterinarian, and Fluff died the next day. I loved that cat, and would not have harmed him for the world – and I harmed him to death. I’d rather they had robbed everything left in my house than to have hurt that kitty boy, but hurt him I did. I am so awfully sorry that he paid for my mistake with his life, and it has been a horribly hard lesson for me, too, even if I am still living. I once took a group of High School students to Washington, D.C. for a student vocational group national competitive conference (the Technology Student Association). One of the off-conference things we did was to visit the Holocaust Museum there. We had previously seen the Mall, and the Smithsonian, so I was fed up with all the other people (doing what we were doing) who were in my way. As we passed through the Museum commemorating the unthinkable numbers of people who were slaughtered, represented by heart-breakingly pathetic, sad little piles of personal items: discarded, confiscated eyeglasses, or toothbrushes, and shoes; some new, some very worn, some large and some appallingly tiny……the idea was implanted very irrevocably that these humans were killed just because they were in somebody’s way -a somebody who had, at that time, the power to remove them, and no conscience to prevent him from doing it. It has been many years since that eye-opening, mind- and attitude-altering tour. Powerful impressions do fade over time, and I was just recently contemplating how that “people are in my WAY, dammit” viewpoint creeps back. I see it every day while I and everybody else is driving….Panamanians, Moroccans, Romans, Dominican Rebublicanos, and Americans (heck, let’s just indict EVERYbody) clearly demonstrate that road rage mindset on the road: others, regardless that they are engaged in their own personal life business, which may or may not be as pressing or as important as MY personal life business, are obstacles in my path towards accomplishing my goal. It’s Hitler on the road….isn’t it? And what about those people (who are employed by the government, usually) who are doing their jobs, obeying the incompetent idiots who are their supervisors, who are causing me inordinate amounts of stress, aggravation, and general-pissed-off-ness when I am trying to get something done because they are doing their tiny little mind job like they were told to do it? OBSTACLES IN MY WAY. meh. I’m not saying I like this personal revelation about myself and my attitude towards others, mind you, but like AA, recognizing the problem is the first step in solving it – assuming I want to actually work on solving it – which is another issue altogether.